Twenty-five 2013-14 PGA Tour cards were hard earned on Sunday following the final round of the Web.com Tour Championship at Ponte Vedra Beach in Florida. Chesson Hadley started the day a shot behind Aussie Scott Gardiner, who took a double bogey on the fourth hole with a double hit and never made the ground up. Hadley closed with a 69 for his second Web.com Tour win of the year. He finished fourth on the money list, so had automatically been promoted to the PGA Tour for 2014 as well as a start in the Players Championship. Only two Australians, Bronson La’Cassie and Scott Gardiner, managed to earn their way to the PGA Tour through the Web.Com Tour in 2013 in what was otherwise an ordinary result for the Australians overall. Bronson La’Cassie finished 6th on the regular season money list, well inside the desired top-25 to gain playing privileges on the main tour. 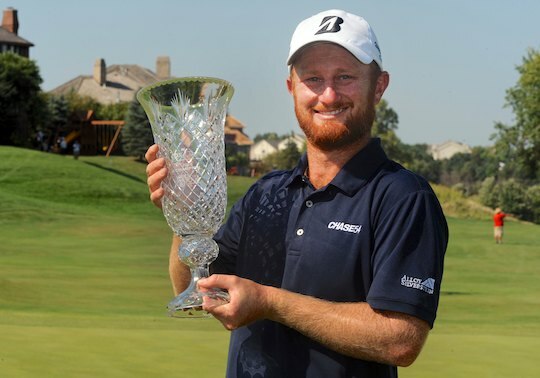 Gardiner did it the hard way by earning his way back to the PGA Tour through grinding it out in the Finals Series, which included a third place in the opening event and a tie for runner-up in Sunday’s Final. Gardiner finished 8th place in the overall rankings, which will ensure him a number of opening starts in the 2014 PGA Tour season. John Peterson won the Web.com Finals money list by just $567 over Hadley to secure fully exempt status on the PGA Tour. The tournament wrapped up the inaugural Web.com Tour Finals, four tournaments in which 25 cards were awarded based on the money list from those events. Players in the top 75 on the Web.com Tour money list during the regular season, and Numbers 126-200 from the FedEx Cup on the PGA Tour gained status to play the final series. Before the finals series commenced the top 25 from the Web.com regular season were assured of their PGA Tour cards. Nick O’Hern, Rod Pampling, Nick Flanagan, Nathan Green, Aron Price, Ashley Hall and Adam Crawford all made the cut in the Season’s Final, yet were unable to secure enough prize money in the four final events and missed out on gaining a PGA Tour card. Cameron Percy, Mathew Goggin and Alistair Presnell will also have status on the 2014 Web.Com Tour. Whilst these Finals series were a work in progress, the ultimate benchmark for any qualifying system – identifying the best players – seems to have been achieved. Despite the confusion and the mathematics behind who was in and who was out, the new process was supported largely by the players as a better alternate than Q-School. The previous alternative had its flaws and the Finals Series is probably going to be a better identifier of who should be promoted as it is played over four tournaments rather than six rounds on two courses under the former Q-School model. We can only hope that next time more Aussies can secure their playing rights and progress to the main tour.